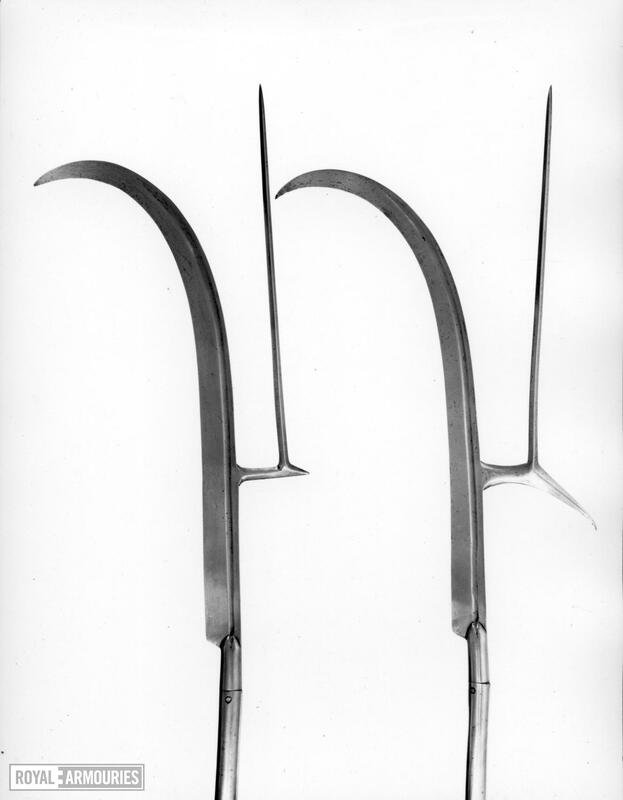 Scythe-like blade, the base in line with the long socket, a down-curving fluke set on the back. From the fluke a long, quadrangular spike rises parallel to the blade and extends to beyond the blade's tip. The haft is from a spontoon and has a tubular shoe. C ffoulkes, Inventory and Survey of the Armouries of the Tower of London, 2 vols, London, 1916, II, p. 235 - group entry for 820-824. 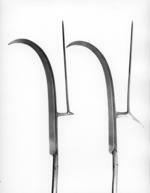 C. Blair 'Welsh Bills, Glaives, and Hooks'', Journal of the Arms and Armour Society, XVI, No. 2, March 1999, pp. 71-85, at p. 80 - mention as part of run VII.820-827 in list of examples of this weapon then known to the author. See entry for VII.820 for information on this type of weapon generally, for a list of all examples in the Royal Armouries, and for a list of those which are closely similar to the present example.